(2 Customer Reviews) | Write Review 4 issues per year Introducing the world's only magazine dedicated to all the cars from the BMC-Leyland empire. Austin, Morris, MG, Austin-Healey, Riley, Wolseley, Jaguar, Rover, Triumph, Vanden Plas, Leyland and more. While brands such as MG, Morris, Austin and Austin Healey, and the ubiquitous Mini, will receive coverage in every issue, you can be sure there will always be something of interest for enthusiasts of the rest of BMC's or Leyland's vast array of brands and models. The BMC Experience is the World's only magazine dedicated to all the cars from the BMC-Leyland groups of companies. 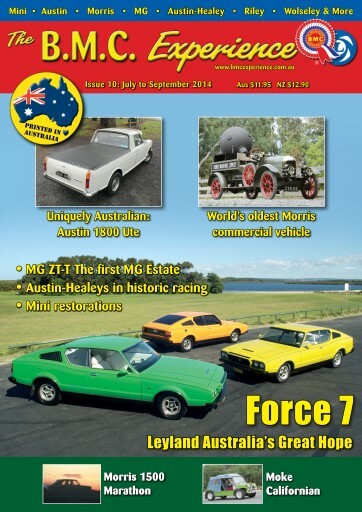 This issue features the world's oldest known Morris commercial vehicle; the story of the Leyland Force 7 coupe; Australia's own Austin 1800 utility; a 15,000 mile marathon in Morris 1500; the story of the Moke Californian; and much more. Introducing the world's only magazine dedicated to all the cars from the BMC-Leyland empire. Austin, Morris, MG, Austin-Healey, Riley, Wolseley, Jaguar, Rover, Triumph, Vanden Plas, Leyland and more. You'll receive 4 issues during a 1 year BMC Experience magazine subscription. Always a well researched and written magazine for the BMC enthusiast, and now even better because it is available on Pocketmags so I can read it anywhere. You'll receive 4 issues during a 1 year BMC Experience magazine print subscription.